A walker is a tool used by people who are disabled or by the seniors who require additional support to maintain balance when walking. Walkers are available in different designs and frames and are usually lightweight for easy management. Choosing from the best walkers for elderly can easily help the seniors with any mobility issues. Most walkers for elderly available nowadays come with additional features such as allowing the seniors to adjust it according to their need. They are height adjustable and make it easier for the consumer to bend their arms. The front legs of the walker may also come with wheels attached but the more common ones have caster wheels attached on the back legs. Using a walker for seniors isn’t difficult; the walker’s frame surrounds a user from both sides allowing room for the hand to be placed on the front helping the user maintain stability. The use of wheels makes it easier for a elderly person to move the walker, avoiding the need to lift it again and again. This feature is suitable for those senior who aren’t strong enough. Hemi walkers are designed for elderly who use a cane but need additional support. It is most recommended for people who may not have full use of one side of their upper body. Folding walkers are for people who need to place a significant amount of weight onto their walker. These may even be placed in locations like the bathroom where the user needs support to seat themselves or get up. Front wheel walkers are similar to folding walkers but with wheels at the front and skids on the rear legs. These are easy to slide across the floor. Rollators are walkers with four wheels, brakes, a seat and often an accessory bag or basket. These are most recommended for seniors who walk outdoors, need to carry items or require a seat to rest frequently. The use of walkers isn’t necessarily constrained to the elderly only. People with back injuries or those who have trouble walking can also use it. Walkers are a useful tool especially for the elderly who can use it to remain independent without having to rely on anyone. A good walker will be comfortable, easy to use and durable allowing people to move freely without being burdened. Walkers are the perfect solution for the seniors who wish to move without help from an individual. They are a lightweight and easy to push around tool. With a walker, you can get the maximum support needed to move around which is a major benefit. Walkers can be adjusted according to the height of the individual and are suitable for both indoor and outdoor purposes. Another benefit walkers have is that they come in different shapes and sizes, have layers that can carry excessive things (not too heavy ones though). But perhaps the greatest benefit that high quality walkers for elderly hold is that they allow you to remain independent. Imagine continuously relying on someone for moving from one place to another. Like everything, walkers have some drawbacks too which is why when selecting a walker it is important to take into account several aspects. One of the drawbacks associated with walkers is that they can cause problems when opening a door against the direction of walking. Walkers may also not be suitable for use on land that isn’t level making it hard to walk. Plus, walkers cannot be used on stairs. Also for proper and safe use of the walker, it is important that the user has the body strength and coordination necessary for stability. For your ease, we have highlighted some of the highest rated walkers for seniors that can be used for maximum support. This walker is Nova’s signature walker with seat that is designed to provide maximum support and stability for the elderly. It can support up to 300 pounds and is also designed very stylishly. The padded backrest flips are curved allowing the walker o fold easily, making it easy to carry around. It is available in 4 different seat heights catering to different height requirements of seniors. So whether you are short height or tall, this item can be adjusted based on your need. The Nova 20” Zoom Rollator Walker is designed to provide stability with comfort for seniors and has feather touch locking hand brakes. It also has a padded seat with a storage underneath to keep different items. The weight is only 16 pounds with the seat height being 20″. The overall dimensions of the walker are 24.5’W x 26.25″D. The seniors customers who have purchased this product have labeled it as a highly recommended product. Plus, they have talked about the ease of carrying the product along because of its folding feature. Customers have also talked about how the product is comfortable to use and when they get tired they can sit on the seat that comes along. This heavy-duty walker by Medline provides maximum stability and support. It is available in a durable metal frame and is strong enough to support around 500 pounds. The rollator comes with 8-inch wheels that are present for additional support and strength for the elderly. As compared to other standard rollators this one is slightly larger (which may make it difficult to get it past different door frames). The Medline Heavy Duty Bariatric Mobility Rollator comes with a padded seat that has a pocket beneath it where you can store extra items. The handles can be adjusted allowing the user to have a more customized fit for seniors. The wide shape of the walker makes it suitable for use by people who are obese. The seniors who have used the product have found it easy to assemble. They have appreciated the overall structure and craftsmanship of the item defining it as comfortable to use. People who are healthy have stated that the walker is sturdy and has enough strength to provide maximum support. This item can be carried around easily because of its foldable qualities. 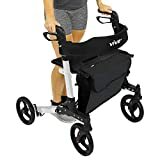 This folding walker by Vive also makes its way on the top-rated walkers for elderly with seat on Amazon. The folding feature allows it to be easily fit into the back seat of a car. The wheels attached to the walker can be removed and the legs can fold upward. Even in narrow spaces, it can be easily used. Another additional feature is the storage bag that comes along and a cane holder. Now the seniors can store them items while using the walker preventing them from getting lost. The walker comes with an easy to use braking system that allows it to be locked when not in use. It also has a seating arrangement that will allow you to sit down if the need arises. Overall this is a sturdy and comfortable walker for which the company provides an unconditional lifetime guarantee. Customers who have used the product have found it to be safe to use and extremely comfortable for the elderly. They have said that for outdoor use it is perfect and its folding feature allows it to be fit easily in the car. Customers have described this folding rollator walker as well made and very well designed. They have mentioned how easily they are able to walk with the support of this walker. This popular walker for seniors has a more traditional look and is suitable for all those who don’t want to purchase modern walkers. The item is perfect for providing the necessary stability and support. It is a folding front-wheel walker that uses a push button method making it easy to operate. It comes equipped with hand grips that assist when walking around. These hand grips are comfortable to hold for seniors. The front wheels are made using high quality and are 5 inches, the back of the walker has glider caps on it to facilitate in moving. 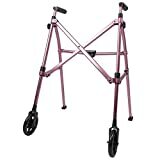 The Walker Folding Deluxe by Health Line is height adjustable and can be used by people of different heights. To prevent any kind of mishap from taking place, it is made using sturdy aluminum. This guarantees the strength of the item. Customers who have used the product have talked about their experiences stating that the elderly understood the use of the walker quite easily. The walker is reasonably priced and its ease of use is what the consumers have really liked. Customers have also talked about the high quality of the product and how successfully it was able to bear the weight of an obese and tall person. Another high rated walker for the elderly is an item by Able Life. This is a folding walker which comes with a 7” diameter allowing room for storage. It is available in three different colors which are black walnut, regal rose, and cobalt blue. The height of the walker can be adjusted according to the requirement and that too with a simple touch of the finger. It can support up to 400 pounds and provide the required support. To support use on different types of surfaces the walker comes with an easy glide allowing the product to be used on different platforms for seniors. The weight of this product is 28 pounds and its collapsed dimensions are 36H X 5.25W x 8D inches. Customer reviews regarding the product state that if you do not wish to go for a walker that comes with slightly updated and modern features, this one is perfect. Use it indoors or outdoors, it is easy to use and more popular among the elderly as compared to the rollator version. The adjustable width and foldable feature of the walker are what customers have appreciated. Another quality that customers like about this product is its lightweight. This walker by Drive Medical is another tool that is among the top rated walkers for elderly on Amazon. It comes with an adjustable side brace that allows the height to be adjusted providing maximum stability. The gliding caps allow the walker to be glided easily over all types of surfaces helping in smoother movement. The sides operate independently of each other assisting in easy movement through narrow and tight spaces. Universal Walker by Drive Medical is lightweight but sturdy because it is made using aluminum to provide maximum strength and support. It has the ability to bear the weight capacity of around 300 pounds. The hand grip is made using vinyl to provide additional comfort and support for seniors. Customer reviews on this product talk about how sturdy the walker is and the ease with which it can be maneuvered. It is very much liked by the elderly as customers have noted incidents of their old age parents who have found this easy to use. Further, It can easily be passed from doorways that are narrow. The walker is very reasonably priced and meets the requirements of the consumers effectively. Older users have appreciated the product because it isn’t complicated to use. 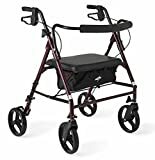 These are some of the bestselling walkers for the elderly available on Amazon. You can choose one that suits your personal preferences based on design, support, convenience of use and outdoor/indoor utility. ZFO Weighted Vest Review-Is it Worth the Money?